NM plastic spacers meet higher requirements and superier user experience. 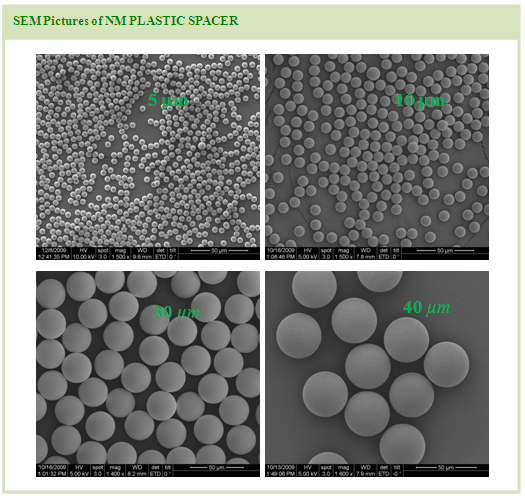 NM plastic spacers contain many superior characteristics such as accurate particle size control , uniform sphere and smooth surface etc. NM Lcd Spacer sells well all over the world with its excellent display performance. A precise control of LCD cell gap containing liquid crystal is critical to achieving the best display performance. Spherical particles used to control the thickness of the liquid crystal layer must meet stringent requirements such as precise particle size, tight particle size distribution, suitable hardness, and excellent resistance against heat, cold and chemicals. The amounts of ions in PLASTIC SPACER are critical and tightly controlled in the entire manufacture processing. The amount of Fe, Ca, K, Na is detected by ICP spectrometer and Cl by ion chromatography. NM PLASTIC SPACER do not contain any chemicals prohibited by RoHS. NM PLASTIC SPACER is inspected yearly by an internationally certified agent to meet all RoHS requirements. The RoHS certification of NM PLASTIC SPACER is current and valid, a copy of which can be sent upon request. Nano-Micro Tech provides three series (H, X and A) of high quality plastic spacers to meet various demanding application requirements for different customers. 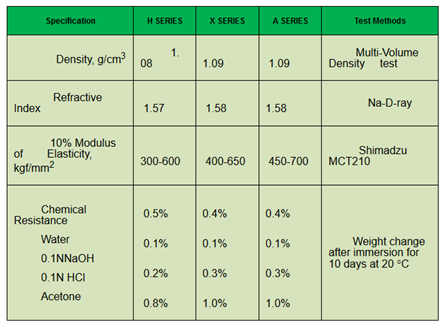 The three series of plastic spacers, in the order of increasing hardness, modulus, and recovery are H, X and A.
NM PLASTIC SPACER provides a broadest size selection from 2 µm to 100 µm. Our state-of-the-art manufacture facilities, advanced analytical instruments and reliable quality control system guarantee the quality and reproducibility of NM PLASTIC SPACER products. 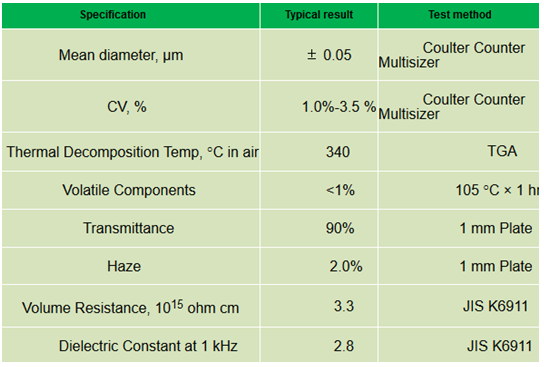 l Standard products are: 2.0-5.0 µm in 0.25 µm increments; 5.0-10.7 µm in 0.10 µm increments; above 11.0 µm in 1.0 µm increment. 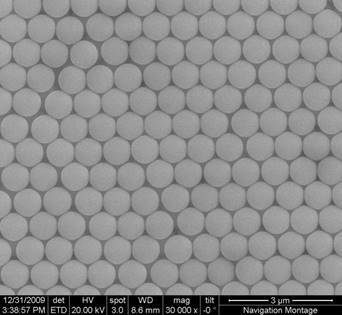 l Spacer of special size, below 2.0 µm or above 100.0 µm, is available upon request. l Mean diameter of spacer is consistent from lot-to-lot according to Beckman Coulter Counter Multisizer 3. Dry Spray : For best results, it is recommended to vacuum dry NM PLASTIC SPACER at 80 °C for 8 hrs (caps off) before dry spraying, which ensures SPACER disperse smoothly and freely. Wet Spray: Disperse NM PLASTIC SPACER in organic solvent such as isopropanol or ethanol, ultrasonicate a while before adding proper amount of water. This usually works better than dispersing SPACER directly in aqueous solution containing of organic solvent. Spraying density and applied pressure should be adjusted according to SPACER size etc.. Service technicians from Nanomicro Technology Company are professionally trained to help our customers to achieve best results. NM PLASTIC SPACER is packaged in 10 g or 20 g glass vials with plastic caps and inserts to keep moisture away from the contents. PET vials of 10 g or 20 g are also available upon request. The label on the vial includes product name, lot number, expiration date, weight, RoHS, inspection passing stamp, etc. NM PLASTIC SPACER vials should be stored in dehumidifying cabinets with controlled temperature and humidity. The cabinet should be set at room temperature and kept under 25% humidity. It is recommended to use up the entire product in a vial once it is opened. Looking for ideal China LCD SPACER Manufacturer & supplier ? We have a wide selection at great prices to help you get creative. All the NM Plastic Spacer are quality guaranteed. We are China Origin Factory of Plastic Spacer ASE 0325. If you have any question, please feel free to contact us.